STEM programs that help educators and families provide engaging, high quality early childhood STEM experiences for young children and helpful STEM resources for use in early childhood programs. Bilingual professional development to support implementation of best practices and high quality in early learning programs across the county. Mentoring for home-based early childhood professionals who often work in isolation without the benefit of ongoing guidance and support. 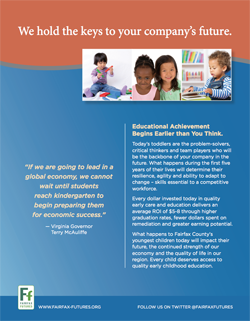 A regional business outreach event to connect business, government and education leaders to the importance of investing in early childhood education and school readiness as key to the region's economic future. Provide meeting space for our leadership events for up to 250 business, government and community leaders from across the region. Donate design and printing services. Read the U.S. Chamber of Commerce Foundation’s Workforce of Today Workforce of Tomorrow: The Business Case for High-Quality Childcare. Write a letter to your elected representatives. Testify at a local or state hearing. If your company shares our commitment to quality education and school readiness in Fairfax County, we want to hear from you! Our leadership represents a cross-section of leaders who recognize early education as the foundation for academic and lifelong achievement and success. If your company or foundation would like to learn more, please contact us at execdir@fairfax-futures.org.